"Obviously, there have been overtures made to Led Zeppelin, but if you start with the first track on the first album, Good Times Bad Times, and you think of the drum part that John Bonham did there -- how many drummers in the world can actually play that, let alone dabble on a Christmas morning? There could be a lot of alcohol consumed over Christmas, and you still aren't going to get it." "I actually think it's a good thing. I do. I think because it introduces kids to music. I was sitting in the airport in Miami, I don't know, a couple of months ago. We were flying somewhere, and me and my drummer and my bass player or somebody, probably my singer too, we were sitting at this restaurant waiting and this little kid, he couldn't have been more than eight or nine years old, and he looks up at us and goes, 'Hey, are you guys in a band?, We go, 'yeah.' 'I want to be in a band!' And this was so cool because a few years ago that wouldn't be happening. Plus, I see in the audience when I play now, every night there's very, very young kids. This is a great thing." "If you're going to spend that much time and energy, get yourself a real guitar. I'm not into virtual anything, if it's not the real thing." "Now I can jam with people in the comfort of their own plastic!" "I've stood at the end of the aisle at Best Buy and watched eight-year-old kids completely dominate the game, but I haven't played. A couple of my songs are featured on the games, so they've sent me the console. But I've never opened the box. I don't think it would be any fun for me -- there are only three or four buttons. Plus I seriously thought I'd mess up my head. One night onstage, I'd be looking for the green and yellow buttons and it would just be strings and frets and I'd be confused." "Who wants to be in a kid’s game, like a toy shop? There’s just this mad avalanche of material that’s available, so it’s so hard for aspiring young players to find where they should go (and) not be enslaved to yet another tool or device." Thanks to Stratoblogster's Jeff Beck article for inspiring this one! Great post! I love hearing from the real dudes.. 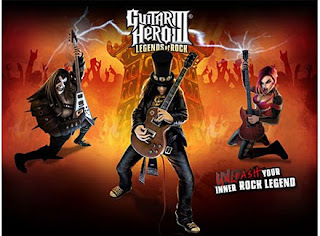 It's interesting that one of these real dudes has since changed his mind and is now one of the Guitar Hero avatars! Blame it on how ridiculously hard it is to sell music these days.